Tired of those old stale blues rhythms you’ve been playing? 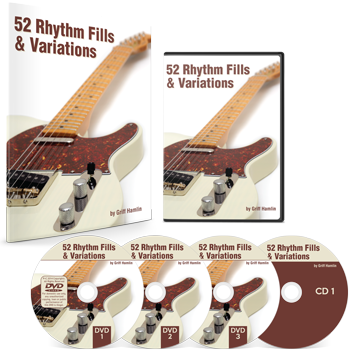 52 Rhythm Fills & Variations will transform your blues rhythm playing so you can play chorus after chorus in the same song without it ever sounding boring or stale… and without having to learn a bunch of “finger buster” chords or exotic scales..
And then there’s the shuffle blues so common in songs like “Sweet Home Chicago,” “Tore Down,” and… well… about 1000 other songs. Yup… it gets pretty dull pretty fast. How do I know? I see it all… the… time. And that’s on top of the other 100,000+ guitar players around the world using my courses and online lessons. Believe me, this is a really common problem and totally not your fault at all. Because the way you’ve learned up until now is in standards and basics… all good things and super important. And as the name implies, there are 52 different ideas in slow blues, shuffle blues, straight feel blues, latin blues, even 2nd line Louisiana styles. 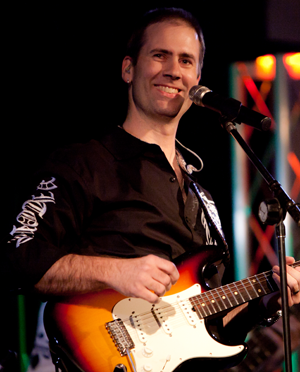 So you’ll never be without some cool ideas for variations on any rhythm or feel that comes up at your next jam session. With even just a small portion of the ideas inside 52 Rhythm Fills & Variations you'll have more than enough ideas to keep your comping and rhythms sounding fresh and unique, chorus after chorus. 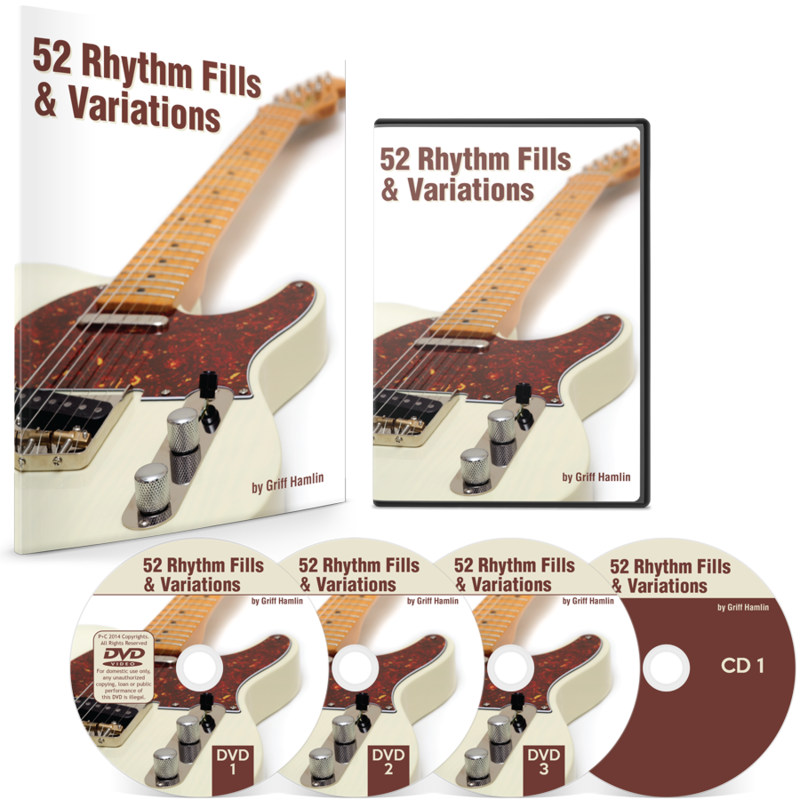 52 Rhythm Fills & Variations comes on either 3 DVDs, with the accompanying CD and printed manual, or there is a digital delivery, instant access version. The digital delivery edition comes standard with the DVDs, so you don't have to choose one or the other. Just choose your format, Digital Delivery, or DVD plus digital delivery, and click the "Add to cart" button to get your copy of 52 Rhythm fills & Variations. Of course, it's not possible to put every single possible variation of every single blues rhythm into 1 course, but I think you'll agree when you get into this course that it will give you the tools to not only use the rhythm examples in the course, but to create your own and really get the creative juices flowing. And don't forget that like all of my courses, you get a full 365 days to try it out for yourself. If it isn't everything I've said it is and more, just let us know and you'll get a full and complete refund, no questions asked, and you don't even have to send it back. I can't make it any more "no risk" than that. I’m only on lesson 1.17 but I’ve learned a load of stuff that I WILL be incorporating into my playing. Excellent, excellent course. This is exactly the stuff I can really use. Thank you Griff!! I think it is some very fundamental stuff that a lot of intermediate players will see as very useful and something that will give beginners something to make their rhythm practice a whole lot more self-entertaining. None of it should be difficult for anyone who can play a 12 bar rhythm pattern and your “kitchen sink” video shows that you don’t need to follow any rigid structure in sequencing the embellishments into your playing. For years I’ve noodled around with rhythms and fills on my own, and have come up with a couple that work really well, but not a patch on what Griff steps ya through on this new course. Step up your blues rhythm game with 52 Rhythm Fills & Variations. 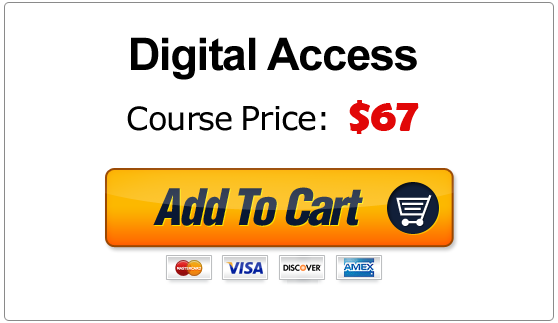 Just choose the “Add To Cart” button below and be on your way to chorus after chorus of exciting blues rhythms. To get your complete copy of 52 Rhythm Fills & Variations just click the yellow “Add To Cart” button below with your preferred delivery method. Just as soon as your order is complete you will receive an email with your access instructions to the secure Member Portal so you can be transforming your blues rhythm playing from boring to killer in just a few minutes from now!